Before a foreign national gets their visa for Japan, they should obtain a Certificate of Eligibility (COE) issued by a regional immigration authority under the jurisdiction of the Ministry of Justice. 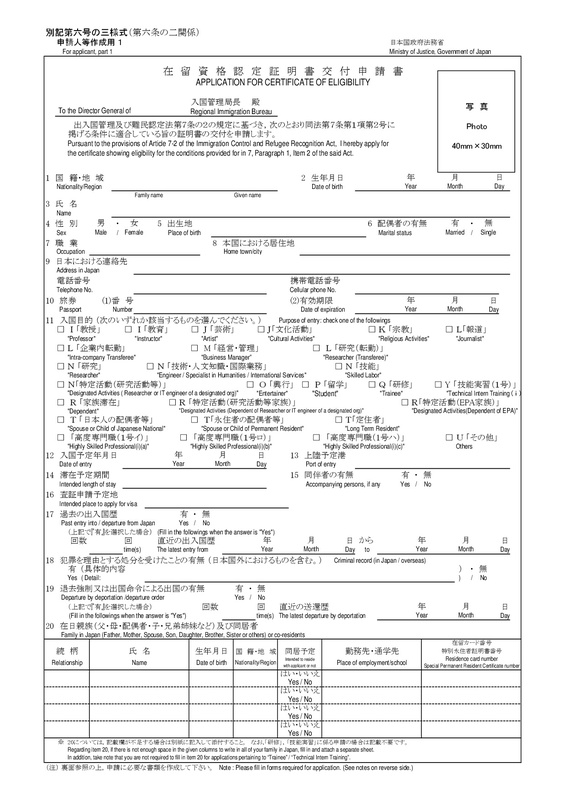 It serves as evidence that the applicant fulfills various conditions of the Immigration Control Act, including those certifying that the activity in which the foreigner wishes to engage in Japan is valid and comes under a status of residence (this excludes Temporary Visitor Status). Issuance of the visa is not guaranteed, however, under certain circumstances, for example: if there was a change in status since the issuance of the certificate or if it becomes evident that the documents submitted to obtain the Certificate of Eligibility were false. For students, it will basically be the preliminary visa screening process, prior to actually applying for the student visa. The Japanese government will approve the Certificate of Eligibility, and the local consulate will approve the visa. Go! Go! Nihon will send the students’ required documents to the language schools. The schools will then submit the visa application to the Immigration Bureau in Japan on your behalf. Students should receive the Certificate of Eligibility for Japan by mail once the Immigration Bureau approves the visa application. Make sure to supply all the necessary documents for your application so the process moves forward smoothly. If the student applies through a Japanese language school using the Certificate of Eligibility, there should not be any issues in converting your visa at the embassy. Usually, the conversion procedure doesn’t take too long, but please confirm with the Japanese embassy or consulate in your city. Once students receive the Certificate of Eligibility for Japan, they should take it and the visa application form, obtained from the Japanese embassy, photos and valid passport to the Japanese embassy or consulate in your city. The embassy will issue the student visa in a couple of days. Photo (4cmx3cm) – a photo that shows the applicant pictured alone, facing squarely to the front without any head coverings. There should be a plain background with no shadows, the photo should be sharp and clear. The photo must have been taken within three months prior to submission. Depending on the nationality of the applicant, other documents may be necessary. This is something that Go! Go! Nihon will be able to help you with as part of the application process, so don’t hesitate to contact us!